Lexicon is very important when playing craps, as you will hear these terms expressed at the table and you can easily get lost and confused and therefore intimidated if you don't understand what they mean. The game of craps essentially revolves around the SHOOTER (who throws the dice) establishing the POINT, then wagers that concern themselves with whether a 7 or 11, or CRAPS is rolled before that point number is made again. The COME-OUT ROLL is really any roll (and there may be more than one) that is made before the point is established. For the point to be established, a roll has to produce a total from the list of points above -- 4, 5, 6, 8, 9 or 10. For example, if the come-out roll, produces a six (6), that is the POINT. Then the players can bet on whether or not another six will be rolled before the shooter throws a seven (7). Players also make PASS LINE bets, which will be explained. If a NATURAL (7 or 11) is rolled before the point is established, the Pass Line bettors WIN. If CRAPS (2, 3 or 12) is rolled before the point is established, Pass Line bettors LOSE. So if the shooter rolls a 7 on the come-out, everyone with a bet on the Pass Line wins. When the point has been established, and a 7 rolls before that particular point is rolled again, all the Pass Line bets lose, and the shooter is replaced. The dice are then generally given to the next person clockwise at the table. Any player, when offered the dice, can choose not to roll, at which point he or she just says "pass" to the dealer and the next person will become the shooter. One quick thing to note - if you do elect to become the shooter, you must bet the PASS or DON'T PASS before throwing the dice the first time. You can walk into the game and know what the point is by finding the PUCK, a round disc-like marker that is placed on the point number. The puck has a white side and a black side. When the white side is up, the point is "live," so to speak. When the black side is up, the point has been made or a new point is yet to be established. 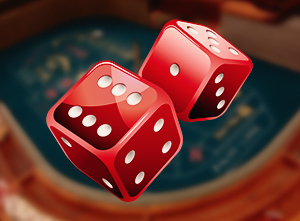 These bonuses allow you to play craps to clear the bonuses wagering requirements. What Makes Craps a Good Game to Play?